BOTANICAL GARDENS BY THE SEAThe Mendocino Coast Botanical Gardens are unique in the continental USA, because they are the the only oceanfront gardens. Located on 47 coastal acres, the magnificent landscape of the Botanical Gardens include canyons, wetlands, coastal bluffs, a closed-cone pine forest and a varied array of floral and plant collections with a gift shop where you can take home your favorite. Bird watchers will love the Gardens, there are more than 160 species of birds that can be seen throughout the year. FUN THINGS TO DO WITH KIDSFamily Friendly Pet Friendly Wheelchair FriendlyThe best thing to do with kids in Mendocino is explore nature! Take a hike in a redwood forest to your kids the tallest living thing in the world. Explore a tidepool. If it's raining, go swimming in our indoor waterpark. 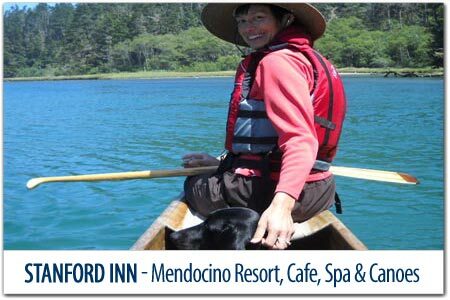 Mendocino is pet friendly welcoming your furry kids, and the perfect place to bring your pampered pooches! HORSEBACK RIDING ON THE BEACHHorseback riding is one of the magical things to do that is on most people's bucket list. Treat your family to a gentle ride on a well-trained horse along the beach or through a redwood forest. Make a wonderful memory, riding a horse is one of those few things that you'll always remember. You can schedule a custom ride for more challenging ride or private group. RENT A BIKE, CANOE OR KAYAKGliding silently along Big River Canyon in a beautiful redwood outrigger is one of life's simplest pleasures, and can be the highlight of your Mendocino vacation. The Stanford Inn's Catch a Canoe and Bicycles Too offers ultra stable redwood outriggers, kayaks, canoe, SUP and bicycle rentals to anyone who wants to explore beautiful Big River and beyond. Catering to families, pets and their owners, singles, couples and groups. They offer tours and maps and insight into the history and geography of Big River and the Mendocino area. INTERESTING PLACES & FACESPoints of Interest Museums Interesting LocalsBecause of the relative isolation, Mendocino remains mostly historic and pristine. Mendocino Village is the only Coastal Town in America, that is designated as a Historic Town. Maybe you've wondered where is Cabot Cove or the Tree that you can Drive through, or where James Dean and Sea Biscuit Slept, here in Mendocino. Enjoy a historic 7-mile round trip over the first tracks laid down by the California Western Railroad along the scenic Pudding Creek Estuary for an one hour round trip. Embark on a scenic adventure aboard one of their vintage motorcars / railcruisers (the original Skunks) or the diesel locomotive-pulled railroad cars for a 4-hour trip to Northspur. You'll ascend to the summit at 1,740 feet before descending into the lush Noyo River Canyon and its majestic redwood groves. ... 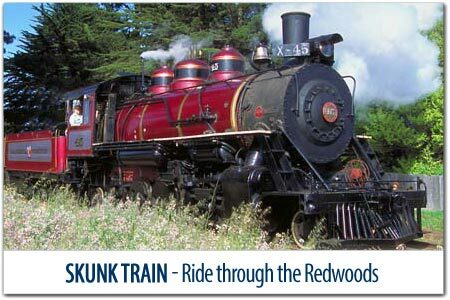 The Skunk Train is great family fun. EXPLORING THE OUTDOORSLighthouses Beaches, Rivers & Lakes ForestsThe Mendocino Coast has an incredible array of sandy beaches, craggy bluffs and Redwood Forests by the Sea! While you're visiting the South Coast, you can take a tour and walk up to the top of one of the tallest lighthouses on the West Coast. Bowling Ball Beach, Point Arena Stornetta, and B. Bryan Preserve are worth a visit. 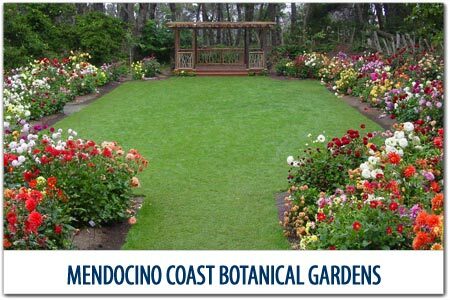 ARTS, EVENTS and FESTIVALSCalendar of Events Festivals Live EntertainmentThere is always fun things to do in Mendocino! From Festivals and events to live performances and art exhibits, and Mendocino locals love to celebrate what makes Mendocino unique. Our vibrant wine region and picturesque coastline offer many opportunities to join in the festivities. WHALE WATCHING FROM SHORE & UP-CLOSEThe best time of year to whale watch is December through April. California Gray Whales migrate South from Alaska to Baja California during the months of November through February and return North during the months of February through April. Usually visible from shore and only a 5-15 minute boat ride gets you a better than 95% chance of sighting these whales and fun for all ages. RELAX and ENJOY THE GOOD LIFEDay Spas Massages SalonsEverybody loves taking it easy, and Mendocino is perfect for relaxing slowing down. There are many ways to relax from sitting awhile to enjoy a pretty view or cuddling in front of a roaring fire. But probably the most popular thing to do is to get pampered! DISCOVERING YOUR MENDOCINO TREASUREBoutiques Galleries NurseriesHalf of the fun of shopping is finding that special something. Like treasure hunting, you're not sure what you'll find, but you know it when you see it! Mendocino is known as an artists colony and a very fun thing to do is finding your Mendocino treasure. As you stroll through the galleries and boutiques, you're likely to find that perfect souvenir. OUTDOOR ACTIVITIESBike & Kayak Charter Boats Horseback RidingAdventure lovers that enjoy unbeaten paths will enjoy all of the choices of where to hike, ride bikes or paddle in the sea or rivers. Hiking, Biking & Kayaking Horses & Golf Courses Whale Watching & Fishing Ride horses on Mendocino beaches, both North and South and enjoy a relaxing round of golf. GOLFING ON THE MENDOCINO COASTTee off with a spectacular view of the Pacific Ocean. Tucked among the hills and noble redwoods, this nine-hole course presents unexpected challenges to golfers of all levels. 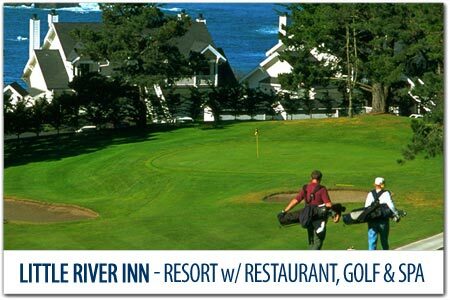 The expansive feeling of coastal golf will permeate your visit as you enjoy one of Northern California's most established and hospitable resorts, Little River Inn, which showcases the only golf course on the Mendocino Coast. Circled by redwoods and pine trees, the 5,458-yard course encourages you to keep the ball in play. They also offer two lighted tennis courts available at no charge to their guests. TASTING LOCAL BEER and WINEWhite Wine Red Wines Local BeerSpend a relaxing day wine tasting. The combination of warm days, coastal breezes, and the fertile soils in Mendocino's Wine Country help produce world-renowned award-winning wines. See the self-guided wine map with over 40 wineries and tasting rooms that are open daily, pouring their award-winning wines.